Technology: As expected, the company is leveraging existing capabilities in terms of launch vehicles, spacecraft, and the like, focusing on developing only those components that don’t exist today. 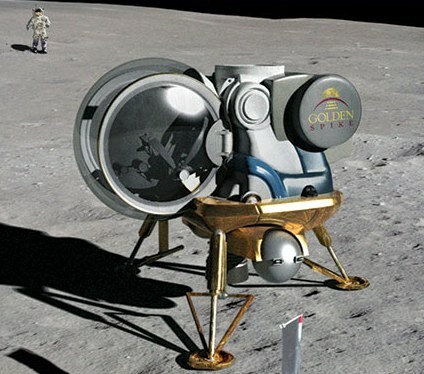 “Take a look at what you’ve already got in terms of existing assets, use existing launch vehicles, adapt crew capsules that are already in development,” said Alan Stern, president and CEO of Golden Spike. “Only develop new systems, like an expedition lander and surface suits, where no system exists today.” He calls this a “head start” architecture that “offers enormous and convincing cost, schedule, and reliability advantages” over an entirely clean-sheet approach. Financing: Even with this “head start” approach, the company will still need significant amount of money to develop this system: Stern said they estimate the cost to be $7–8 billion, which is still far less than any other human lunar mission approach. Stern said that while they’ll raise the money though a variety of means, including advance sales of expedition and an “enterprising financing plan,” they’ll still need to raise “hundreds of millions of dollars” from outside investors. Other markets include individual tourists or companies interested in commercial exploitation of the Moon. Stern said he’s talked with one unnamed individual who is “very seriously” interested in such a trip. Human missions, said Stern, “will attract a lot more interest, and, unlike a figure-eight flyby around the Moon”—a reference to the Space Adventures proposed mission—“these are serious scientific expeditions, so you don’t have to justify it as a stunt” but instead as science. Indeed, human missions to the surface of the Moon are far different than anything else proposed to date. Whether they are exciting and compelling enough to open up investors’ pocketbooks and space agencies’ coffers to the tune of several billion dollars is a question whose answer will unfold over the next few years.